They say old dogs can't learn new tricks. Well I am here to say that it can be done and to prove it! Just check out the little tricks I am learning in doing a simple four-square block. First I have pulled my ironing board right next to my sewing table. Why didn't I think of this before? DUH! But then once my nursing school buddy found me helping a patient bathe himself by me standing between the sink and the patient and passing him his rinsed out or soaped up wash rag..."Just push him up to the sink, silly!!" Brilliant, I thought, thinking her so clever! I have since realized that "common sense" isn't always common for some of us!! My ironing board makes the perfect L-shaped sewing set-up for lay out or pressing...I haven't quite figured out the iron cord that stretches across the room but that will come later, after I break my foot from a falling iron, flattening it perfectly as well as my quilt blocks?! I am learning too that when sewing blocks together right-side to right-side DON'T back-stitch at either end of the square. Sometimes more secure doesn't make for smooth seams that press flat as you will see later. My ironing board makes a perfect L-shaped sewing table! How perfect is this? I have also learned to press a seam just as you sewed it to "set the seam". Not sure why ironing it flat as you sewed it makes a difference but it does. It will lay flatter then when you press it to either side as most quilters do. I was also reminded to press the seam toward the darkest block of fabric, making it less visible to the other side, though later this didn't always work out when I pressed my four-square block. I am learning that there are many other secrets to pressing, but just like other rules, one learns them only to unlearn them in other circumstances. Again common sense prevails (if you have any!). Perhaps I will learn some "common sense" before I am finished? 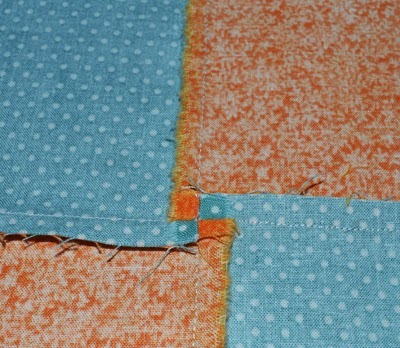 When you sew the pressed-open two-block pieces together you can feel the seams butting against the other. I have unsuccessfully tried to rely on sight versus "feel" and didn't always have my seams butted closely together. This fixes that and I'd like to think that I have developed a rather magical sense like I developed when tying fishing leaders. Touch replaces vision in many circumstances and this is one of them. 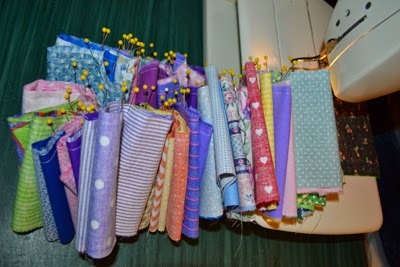 I pin to secure my blocks for sewing, as I am an insecure sewer, and sadly I sew right over them. This is a confession, as all sewers know it isn't good for your machine to sew over pins! My machine seems to be indestructible, though I wouldn't trust all to be as sturdy as mine and I do occasionally break needles doing this! Perhaps I will soon feel more secure about pulling them out as I sew close to them? 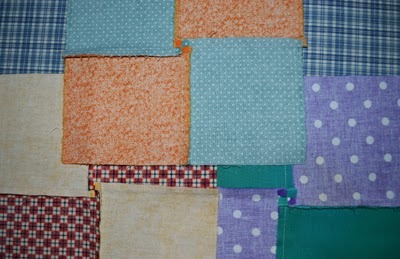 Blocks joined by butting their seams together by feel. Thanks tablet teacher! After sewing seams, always "set the seam" as I have mentioned above and then press the seams of your four-square block going in opposite directions (see below), picking out the few stitches in the middle of your four square block so that it can lay flat and form and inner tiny four-square block. This is the reason that you didn't back stitch at the ends of your blocks. This mini-four-square block in the middle isn't just cute, but lets you know that it will lay flat. When you press it put the iron directly on it and press it without stretching your block. Well, OK, sometimes "old dogs" forget and work too hard to be sure their seams are flat and stretch their block! 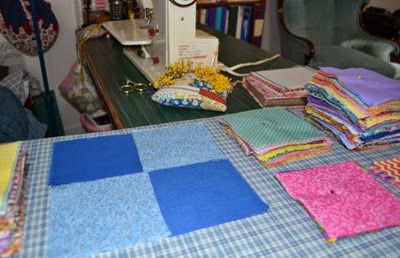 I am hoping that when sewn altogether I can square these blocks up again in their final sewing. See my tiny four square that presses out flat (almost). More tiny four squares (find 3)! I can do it and it isn't so slow after a couple! And real quilters save thread by sewing their blocks one right after the other without stopping...check this out...and it is fast too! I am feeling more professional as I go!!! Check how much thread I am saving! I hope my pictures will help you. Know that there are many good instruction videos on line! 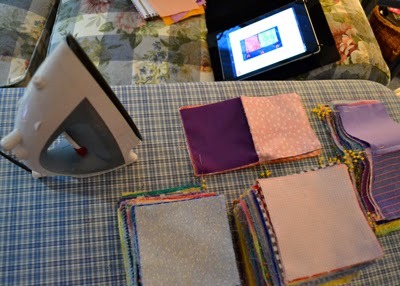 Thus begins my home quilting sewing course (check Pinterest). My formal sewing instruction has been limited since high school and sadly, while my high school home economics teacher, Mrs. New, was an excellent tailor and knew everything, I wasn't smart enough to take all she said seriously when I should have. I thought myself so smart to learn every shortcut to avoid the techniques of fine sewers. I had a younger "more hip" sewing idol who didn't use patterns and knew all the short cuts. She truly had a talent that I did not, though I tried to take every short cut that I imagined she took for many disastrous results?! As I have said, common sense isn't so common! I am now determined to learn the correct ways of sewing, for I am sure they were done for a reason. I have learned much of life's lessons in exactly this same style, always testing to be sure that there isn't a short cut to better living and finally returning to the source of all guidelines to find that He had a reason for issuing commandments and NOT suggestions! I am experiencing a full conversion in more ways than one! I have always said that "the good" die young and I think I have had my days extended to "get it right". I hope to disprove this theory if an when I perfect my quilting skills, though I have much to correct yet before I reach any state of perfection. I have learned, however, that the expert Amish quilters intentionally make a block that isn't in keeping with their quilts for only God creates perfection, so perhaps I will just adopt their practice and God need not "beam me up"* early when my sewing improves? *It was my good friend, Veronica (Hallissey), who wrote to me saying that she had tripped over her night stand in the middle of the night and figured that "God had beamed her up"....Now I shall envision the grim reaper as merely an episode of Star Trek and hope to get beamed up instead?